To have a great relationship, there needs to be a high level of respect on the part of both partners. Couples who are less intentional and accomplished in this area will find that their lack of respect holds their partnership down to a lower level of well-being. There are some simple steps one can take to stop habituated patterns that are disrespectful and replace them with more responsible ways of relating. 1. Listen attentively to your partner’s needs, desires, and concerns. 2. Show that you notice your partner’s needs, desires, and concerns by acting on what you discover about the partner. 3. When your partner is direct with requests, respond to what he or she asks for and act on those requests in a timely fashion. Leave no room for procrastination; really show up. 4. Speak words of acknowledgment, appreciation, and gratitude not only for what your partner does but for who your partner is. 5. When using humor to enliven the relationship, be careful to only playfully tease and not to wound with sharp barbs. 6. Only make comparisons to others for the purpose of calling attention to your partner’s strengths and talents. 7. There are intimate details that only you are privileged to know; never violate confidentiality. 8. Carefully spar with your partner to work out differences during a conflict. 9. When bringing a complaint, be careful not to go over the line to criticism. 10. Replace cutting sarcasm with gentle language. 11. Speak directly to your partner rather than sharing your complaints with others. 12. Banish all forms of contempt, including rolling of the eyes. 13. Omit impatient and irritable tones from your communication. 16. Make room for your partner’s style. There are many ways to get things accomplished. 17. Assure your partner that there is room for many opinions. 18. Support your partner’s choices whenever you can. 19. Acknowledge whatever level of financial contribution your partner makes to the family expenses. 20. Acknowledge how much your partner contributes to you and your family on the non-material, emotional level. 21. When you make an unskillful choice, apologize as soon as possible. 22. Take responsibility for the ways you harm your partner. Get busy learning from your breakdowns so that you don’t continue to harm your relationship. 23. 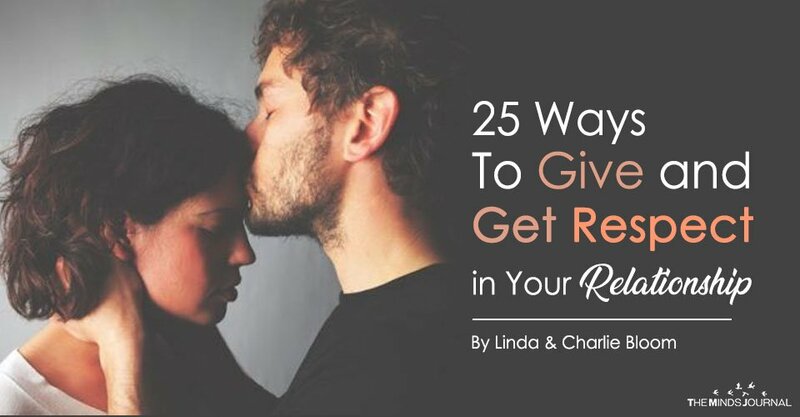 Be quick to offer forgiveness when your partner makes unskillful choices. 24. Tell your partner that you are proud of her or him. 25. Declare your respect for your partner in front of others. Be sure to tell your partner that you are overjoyed with the partnership you are co-creating and that you’re pleased to have a partner who’s worthy of your respect. These ideas are just a starter kit; you can certainly come up with some splendid ideas of your own. If you follow these simple guidelines, you have a right to expect that you will soon find yourself in a more enriched partnership. Don’t take our word for it; look to your own experience and see what you discover. And be sure to enjoy the process as much as you can.